Foam Expo is North America’s first free exhibition and conference event on the design and manufacture of flexible and rigid foams for technical applications. It is specially designed for foam-industry professionals to network and keep abreast of the latest industry news and developments, while learning about the latest application designs, manufacturing processes, and current trends. 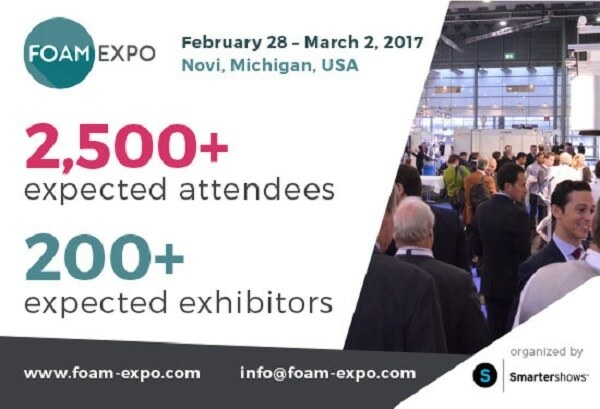 Foam Expo takes place from February 28 - March 2, 2017 in Novi, Michigan, USA. Visit www.foam-expo.com/conference-agenda for the full conference agenda. Register for free today here. Our aim is to give the technical foams industry the stage it truly deserves. If you are involved in the purchasing, integration, manufacture or supply of materials, products or equipment, you can be certain that your suppliers, customers, competitors, and peers will all be at the show. Foam Expo is a unique event for the technical foams industry, where professionals can discover new application designs, manufacturing processes, and current trends. It is at the fore of the latest innovations in advanced and technical foam materials and products, and industry insiders attend from around the world – bringing their experiences and ideas with them. Foam Expo offers you direct contact with the engineers and executives who produce materials and products used in a range of applications – from automotive, aerospace, and construction, to medical, packaging, and sports and leisure uses. You’ll see exhibitions of innovative materials and products that set new industry-wide standards. And you’ll have the rare opportunity to discuss in person the purchasing, integration, manufacture and supply of materials, products, and equipments with your suppliers, customers, competitors, and peers. I’m looking forward to networking with our customers and developing relationships with potential customers… [and] to gathering information on new materials and new technologies in the area of foams. The benefit of Foam Expo 2017 is that is it attracting a wide variety of customers and suppliers. The foam industry has matured over the years, and… I’m looking forward to learning about the latest foam technology at the conference and [using] this knowledge to improve my company’s products and technologies. We’d love to hear from you. For conference inquiries, contact Sarah Myles, [email protected] or call +441273 916314.